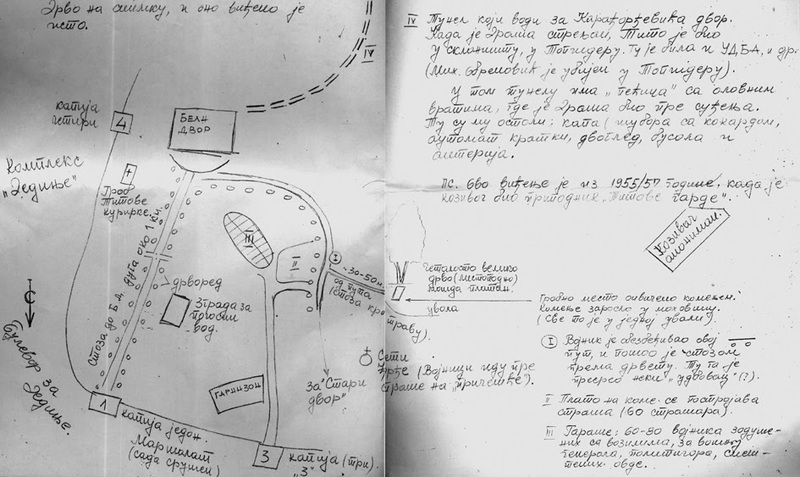 A former Tito’s elite guard member claims to know where is the grave of Draza Mihajlovic. He passed his knowledge to a historian from Nis, Aleksandar Dincic, with one condition – not tell anyone his name. The reason is the retaliation he experienced when he found out details about Draza’s liquidation, and the fear that it will be repeated. The guardsman served in the military (JNA) from 1955 to 1957 in the complex of [the] White Palace in Topcider. He gathered information from the testimonies of older guardsmen and from his own experience, writes Miroslav Samardzic, for “Sloboda”. [For a] Year and a half after the liberation [Oct. 22, 1944], says the guardsman, Tito used to live in shelters from air raids, made under the White Palace on the eve of World War II. He was also in one of them during the liquidation of Draza Mihajlovic. Mihajlovic was placed in the same shelter to spend the last days of his life. From there he was taken to his trial in the Guard House in Topcider. His belongings were left there, and later transported to BIA’s museum. According to the guardsman, Draza was buried in the complex of the White Palace, in a valley below the church of St. George, where the terrain is lowered to Lisicji Potok. The fence there, located underneath the grave, divides this slope of Liscji Potok into two parts. At the time the guardsman was there, Draza’s grave was bordered with stones mottled with moss. Just above the grave was a forked deciduous tree, probably planetree. Around it was a lawn, and through the lawn, next to the grave, was the footpath which guards used to get to the fence. This path is separated from the road that leads from White to Old Palace. The grave is located about 30 to 50 meters from the road. The testimony of this guardsman should be taken seriously, because it essentially coincides with the version that Samardzic learned from Zagorka Vasic, an intelligence officer of the [under the command of] General Miodrag Damjanovic, Commander of Chetniks who at the time were in [Displaced Persons] camps in Italy.